The unique and vibrant photography of Willmar native Jared Eischen will be on display in his show “Color of the Midwest” from Aug. 20-Oct. 10 in the Charles Beck Gallery on the Fergus Falls campus of Minnesota State Community and Technical College. A photographer, videographer and licensed drone operator, Eischen is especially intrigued by the use of drones in photography and the unique perspectives that they make possible. 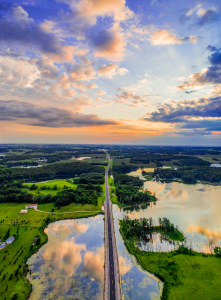 Much of his work reflects the use of both photography and videography to create stunning and vibrant photos, mainly of landscapes in the Midwest. Eischen graduated in 2017 with a bachelor’s degree in film production from Minnesota State University Moorhead and currently is a creative media specialist for Scheels in Fargo. The art show is open to the public, with an artist’s reception set for 2-4 p.m. Wednesday, Aug. 29. The Charles Beck Gallery is open during regular campus hours, 8 a.m. to 8 p.m. Monday through Thursday and 8 a.m. to 5 p.m. Friday.